Is the support of HBCUs by black PWI students still valid? The "PWI vs HBCU" debate is something that we as educated black folks just can&apos;t seem to get away from. I understand, no one wants their blackness questioned or their knowledge downplayed based on where they chose to attend college. 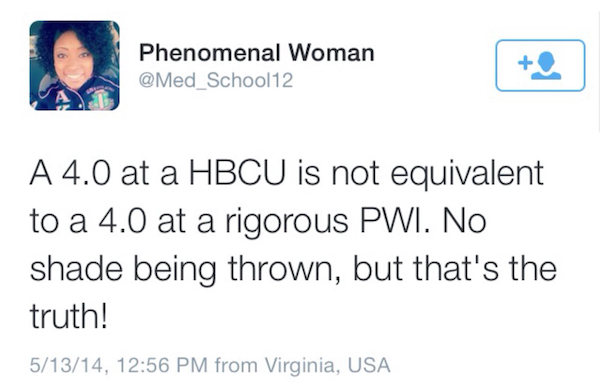 Although I will be a proud HBCU graduate in the Spring, I&apos;m not a huge fan of the typical "PWI vs. HBCU" rhetoric. I&apos;ve always believed people have various reasons for attending whatever college they choose. What&apos;s important is that black people get educated, and bring their knowledge back to our people. However, my attention has been drawn to another perspective of the debate. A couple of weeks ago, a freshman basketball player from North Carolina State University, Dennis Smith Jr., wore a sweatshirt that read "HBCU&apos;s Matter" after his game. I thought it was great that he was bringing attention to HBCUs because they do in fact matter, especially in a state like North Carolina which just last year proposed a bill that would substantially cut tuition and revenue to three HBCUs in the state. However, his apparel was met with mixed reviews. Many people asked if he had the right to wear that sweatshirt because he doesn&apos;t attend an HBCU. So then, the question must be posed what happens when black students from PWIs start supporting HBCUs? Better yet, is their support even still valid? First things first, I get it. I get why some HBCU advocates and enthusiasts may be giving this notion the side eye. It&apos;s almost like, ok, if HBCUs matter and they&apos;re so important to you, why wouldn&apos;t you choose to attend one? The history of Historically Black Colleges and Universities is rich and telling of the history that black people have dealt with in this country. Before we were allowed to integrate predominately white institutions of higher learning, we had to create our own spaces. HBCUs are filled with such rich history and knowledge, yet one of the biggest problems that these institutions have faced over the years was the declining number of students at HBCUs. Why is this? Is it because we feel that our spaces aren&apos;t necessary when we can fill theirs? Or is it because people don&apos;t realize the affluent heritage that is all around you at an HBCU? If they matter, why wouldn&apos;t you enroll in one? I also believe that this defensiveness comes from the fact that so often HBCUs are thought of as inferior in comparison to their PWI counterparts. It&apos;s true that HBCUs often times don&apos;t receive as much funding as PWIs. They&apos;re rarely advocated if mentioned at all by high school guidance counselors which can lead to them being viewed as "less than." However, lack of education being received at these institutions is not the problem. The first step of dissolving this narrative and creating a new one is to draw more support to these institutions and more positive publicity. Therefore, why are people mad about reverence for HBCUs no matter who it&apos;s from? I was raised by a mother who graduated from a PWI and a father who attended the same HBCU, Mississippi Valley State University, that I chose. Although my mother didn&apos;t attend an HBCU, she has always unashamedly supported HBCUs and even encouraged me to attend one. It is completely possible to know and uphold the importance of HBCUs without choosing to attend one. Financial reasons, programs related to major, and proximity were just a few of the reasons that my mother chose a PWI. There are so many different factors that go into picking an institution of higher learning, what&apos;s important to understand is that choosing to support HBCUs and choosing to attend one are not mutually exclusive. A huge part of the problem is the divisiveness of the whole debate. Questioning the validity of their support draws an even bigger gap. HBCUs need support and monetary donations, no matter who they&apos;re from. Truthfully, in addition to accepting support from all black people, we need to be calling HBCU alumni to do a much better job of giving back to our universities, both public and private. Especially when there are states purposely withholding millions of dollars from our beloved institutions. It&apos;s not about "us vs. them" when it comes to black people and our education, at least it shouldn&apos;t be. Our main concern should be changing the negative narrative of our HBCUs, educating the youth about their importance, and creating a future for these institutions to thrive in. When students from PWIs support HBCUs, a bridge is gapped and love is shared.